Virtual reality, once the domain of terrible video games, has advanced far enough now that important historical events are being cataloged specifically so that they can be experienced virtually by future generations. 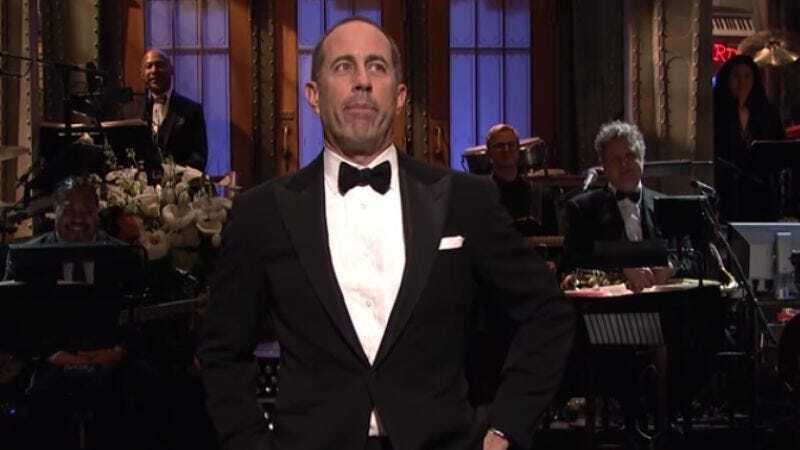 Okay, up until today, the important historical events mostly consisted of basketball games, but now NBC and Samsung have released a virtual reality experience based entirely around Jerry Seinfeld’s “Questions From The Audience” segment during SNL 40. That means fans of taking questions from an audience who own an Oculus VR headset and whichever Samsung device is required to access the VSRE app or the Oculus VR store can experience all of the laughs from this one small part of SNL’s anniversary celebration. This news comes from MTV, which says entering this virtual world is just like sitting right in the center of the audience, and it lets you look in every direction and see what the famous people in attendance were doing when the cameras weren’t on them. You could catch Taylor Swift coming up with her next great song idea while Michael Douglas complains about not being asked to host SNL more! You could stare directly at teen heartthrob Kyle Mooney without him ever knowing! You could even watch Larry David refuse to go to the afterparty over and over again! You could just live in the moment forever, only removing the VR headset to bathe and eat. It would be just like heaven, except sometimes you can turn your head and see that Sarah Palin is sitting near Steven Spielberg, which seems weird no matter where you are. Meanwhile, luddites who hate the forward march of technological progress can just watch the clip embedded below. Also, for the enlightened few who have abandoned their corporeal forms in favor of permanently living in these seven minutes of SNL 40, don’t forget to check out this virtual recreation of the apartment from Seinfeld. Hopefully, someone is hard at work on a VR thing that’s Bee Movie-related.